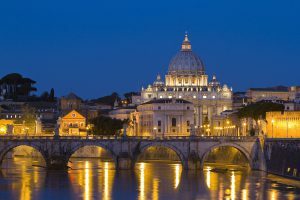 Gems of Italy tour features three legendary cities Venice, Florence and Rome which are literally steeped in culture. Venice with its old world charm – magical and timeless, offers a wealth of iconic sites. This floating city spreads across 100 islands. Its basilicas, palaces and towers bear witness to another time. Florence, the birthplace of the Renaissance is one of the most romantic cities in the world. Its network of narrow winding streets, icon fashion house and galleries displaying some of the world’s priceless art treasures. And Rome, the eternal city, where ancient landmarks and monuments tell the story of Rome’s history where every street tells a story. Sip an espresso and toss a coin into the Trevi Fountain to ensure your return. We begin our exploration of Venice with a boat ride to the Murano Island, famous for its artistic glassware. Visit a glassblowing factory, where you will watch a demonstration of traditional Venetian glassblowing by master craftsmen. Leaving Venice drive to Ferrara, a Renaissance gem in the Emilia-Romagna region straddling the banks of the Po River. 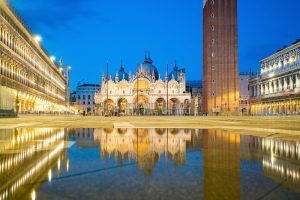 An orientation tour (no interior visits) will take you past some highlights such as the San Giorgio Cathedral dating back to the 12th century, the city gates, medieval walls and cobblestoned streets and a storybook castle that has towers, a moat and a drawbridge. We now head to Pisa on the right bank of the River Arno to see the Piazza del Miracoli dominated by the five naved St. Mary of the Assumption Cathedral, the Baptistry dedicated to St. John the Baptist, the Campanile (Cathedral’s bell tower) located behind the Cathedral known worldwide for its tilt to one side and the Camposanto or old walled cemetery at the northern edge of the square. Our day ends in the Renaissance city of Florence, capital of the Tuscany Region with dinner. 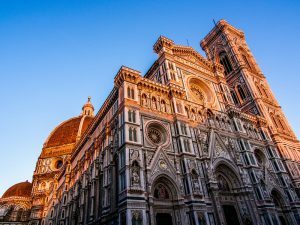 Our morning city tour begins at the majestic Piazza del Duomo in the historic heart of the city to see the Basilica di Santa Maria del Fiore (Duomo) crowned by Brunelleschi’s Dome. Continue to Giotto’s Bell Tower, a focal point of Florentine Gothic architecture designed by Giotto. Next is the Baptistery with its three sets of bronze doors including the east pair by Lorenzo Ghiberti known as “Gate of Paradise”. Continue to the Academy of Fine Arts housing Michelangelo’s marble statue of David created between 1501 and 1505. The tour ends at the Piazzale Michelangelo dedicated to the Renaissance sculptor Michelangelo and offers the most spectacular view over Florence. The remainder of the day is yours to savor the Renaissance splendor of the Tuscan capital on your own. Traveling towards Rome we drive through the stunning panorama of Tuscany and Umbria to Assisi, birthplace of St. Francis, the founder of the Franciscan Religious order and St. Clare, founder of the Poor Sisters which later became the Order of Poor Clares. Enjoy a walking tour of the main square and visit the Basilica of St. Francis, a UNESCO World Heritage Site. Begun in 1228, the basilica was built into the hillside and is made up of two churches – the Upper Church and the Lower Church. A full day of touring begins at the Vatican Museums inside Vatican City where a priceless collection has been amassed by the Roman Catholic Church over the centuries. See the Sistine Chapel where Michelangelo created the famous Last Judgement over the altar. Saint Peter’s Basilica, the center of Christianity and the largest church was built on Vatican Hill. The most famous monument in St. Peter’s is the Pietà, a marble sculpture created by Michelangelo of a young looking Mary holding the dead body of her son, the only work by Michelangelo that bears his signature. Head to the Colosseum, the largest amphitheater in Rome built primarily to entertain the masses with brutal and barbaric games. Next is Palatine Hill, one of the seven hills of Rome, one of the most ancient parts of the city standing above the Roman Forum. Nearby is Circus Maximum, the largest stadium in ancient Rome where chariot races once took place, but occasionally used for gladiatorial combats. See the Imperial Palace and the Roman Forum, the marketplace of Rome. Using your imagination you can visualize what it looked like in the days of the Roman Empire. A full free day in Rome. Your tour director will have suggestions on how to spend your time. You might want to visit some of the wonderful shops, galleries and museums or relax in a sidewalk cafe – there are plenty of things to do and see, depending on your interests. Tonight, a farewell dinner with your fellow travelers will provide a perfect way to celebrate your glimpse of Italy.